Witchboard is an American-made horror movie that was released in 1986. It’s a story about a woman who gets obsessed with a Ouija board and ends up being in danger of becoming possessed by the spirit she summoned up via the board. 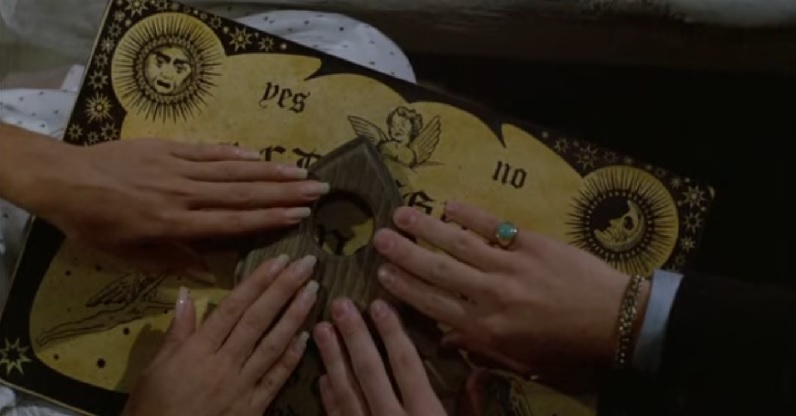 “Witchboard” is one of several alternative names for a Ouija board, so if you didn’t know what a witchboard is, now you do. All the trouble starts at a party. Perhaps that’s not unusual because trouble often finds its way into such gatherings. What is unusual, though, is the trouble is not a punch up, a cat fight or a slanging match. The trouble at this particular party has Ouija written all over it; the spirits are flowing freely and easily and something nasty has found a portal into the world. The party is at the home of Jim Morar (Todd Allen) and his girlfriend Linda Brewster (Tawny Kitaen). Most of the guests at the party seem to be Linda’s friends from law school, but a couple of Jim’s buddies from the building site where he works have turned up to make sure that Jim isn’t the only one who feels out of place among all the suits and ties. Brandon Sinclair (Stephen Nichols) is one guest who definitely does not work on a building site. The guy has money written all over him from his $800 suit to the sports car parked outside in the drive. He and Jim go back a long way, but unfortunately Brandon and Linda also have a history together and so the relationship between the two men is a little strained to say the least. Brandon still has feelings for his ex, anyone can see that, and he believes that Jim stole Linda away from him. Being the crazy kind of a party-loving dude that he is Brandon has brought his trusty, old Ouija board along with him (no party should be without one). Although Jim and his buddies scoff at the idea of the Ouija board and see it as a bit of a joke, Linda seems intrigued to say the least and, in the end, it is she who ends up working the board with Brandon, while an obviously unimpressed Jim works his ticket and tries to get in a few wise cracks as and when he can. Brandon and Linda sit together on the couch, with the board on their knees and their fingers on the planchette, while Brandon attempts to get in touch with the spirit of a little boy called David. Brandon tells the gathered onlookers that he often contacts David, and he believes the young boy has a connection with that particular board. On their first attempt something comes through, claiming to be David, but Brandon realizes straight away that it is not David at all, so he pulls away from the board and breaks the connection. On their second attempt, however, Brandon and Linda suceed in contacting the little boy and Linda seems delighted by the whole experience. After one wise crack too many by Jim though, David takes offence, the planchette goes crazy and he goes off in a huff. Seconds later there is a loud bang from outside and Brandon finds that one of the tyres on his car has blown. The party only takes up the first few scenes of the film, but that’s where the trouble starts because, distracted by his sudden flat tyre, Brandon forgets to take his board home with him. The following morning, while Jim is at work, Linda notices the board and decides to try it out on her own. And using a Ouija board on your own is never a good idea. Linda is blissfully unaware of this fact though, and after a spirit, claiming to be David, comes through and tells her where to find a lost ring, she is hooked on the damned board and uses it more and more and always on her own. Although the spirit that Linda believes to be David is helpful at first it soon shows another side to its nature and it isn’t long before knives are flying through the air of their own accord. By this point Linda has to admit that something bad has entered their home and even the sceptical Jim has become a believer. Accepting the fact that there is a problem is one thing. Doing something about it is a totally different kettle of fish. The spirit does not want to go and Brandon has to bring over an extremely competent (and fantastically wacky) medium to try and rid Linda and David of the troublesome spirit. After the seance David appears to high-tail it out of there in rather dramatic fashion, but things are not what they seem and Jim and Brandon soon discover that things were never exactly like they seemed to be in the first place anyway. 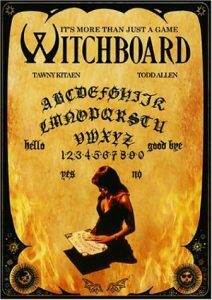 Witchboard is a great film and, although it does have some amusing moments, it is quite terrifying in places and at times it is hard not to jump in your seat. Especially if you are watching it for the first time. And once you do see it the first time probably won’t be the last time either because Witchboard is one of the few films that are special enough to watch over and over again. I have seen it a few times myself through the years. It is a good film. A classic. Yet many people who are familiar with the films sequels (there are two of them) have never seen the original, which is sad because it’s the best.